Here's the good news: millennials are on track to be the most educated generation ever. All the cajoling from our parents and grandparents on the importance of an education has paid off! But, as you might imagine, there's a downside. Despite our awesome education, millennials aren't getting jobs. Want some more bad news? Most millennials with jobs aren't earning what they used to. That said, some of us are doing just fine. 1. Millennials are the best-educated generation ever. 2. 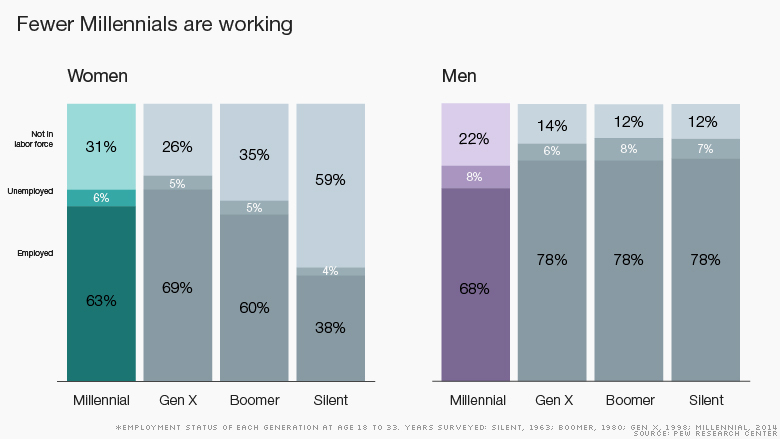 More Gen X-ers than millennials are employed, and millennial women have a slight employment edge over men. Go women! It's about damn time. Now let's let wages catch up. 3. Some millennials have found ways to make a solid living, but those working "regular jobs" aren't paid as well as in the past. See my Final Thoughts below for more on this point. If you're one of those not finding a job, pave a new path. It's not going to be easy, but it is that simple. If you can't make the money you want to make in your current industry with your current skill set, invest in new ones. Look elsewhere. Don't complain, evolve. Jobs are going to continue disappearing, whether due to the changing nature of employment, the rise of robots and artificial intelligence, or collapsing economies. So we can't count on what used to work, because the world 50 years ago was nothing like the world today. It's no longer about your history -- what you've done in the past. It's about your future -- the results you can provide and the skill sets you can continue to evolve. The bottom line: Resourcefulness will always win.